It is important to select the proper pump tank for your central cooling system whether it is a chiller or cooling tower system. OPERATING. Have enough water in the tank. TO PREVENT PUMP CAVITATION (air pulled into the pump along with water). Be sure that about 18” of water is above the pump suction. TO ALLOW FOR WATER / AIR SEPARATION (air is induced into the water in the cooling tower to promote evaporation, not as critical with a chiller system). TO HAVE THERMAL STORAGE to smooth out demand spikes. START-UP. Have enough water in the tank. TO FILL THE SYSTEM... and have enough operating volume remaining. SHUT DOWN... Have enough water in the tank. TO CONTAIN DRAIN BACK... from the tower or chiller without overflowing. TO HANDLE DRAIN BACK... from the process piping (generally the water in the process piping is trapped so that most of the process water remains in the piping). Which Tank is the right size for your application? From our experience, in most applications and installations, use the following guideline for selecting the proper tank. Or, for high flow systems (greater than 3 gpm/ton) select a tank size so that the water will reside in the tank for at least 1 minute. Towers that hold a lot of water. Towers that are located a long way from the tank. Systems that don’t keep the piping full at shutdown. Don’t forget future expansion needs. 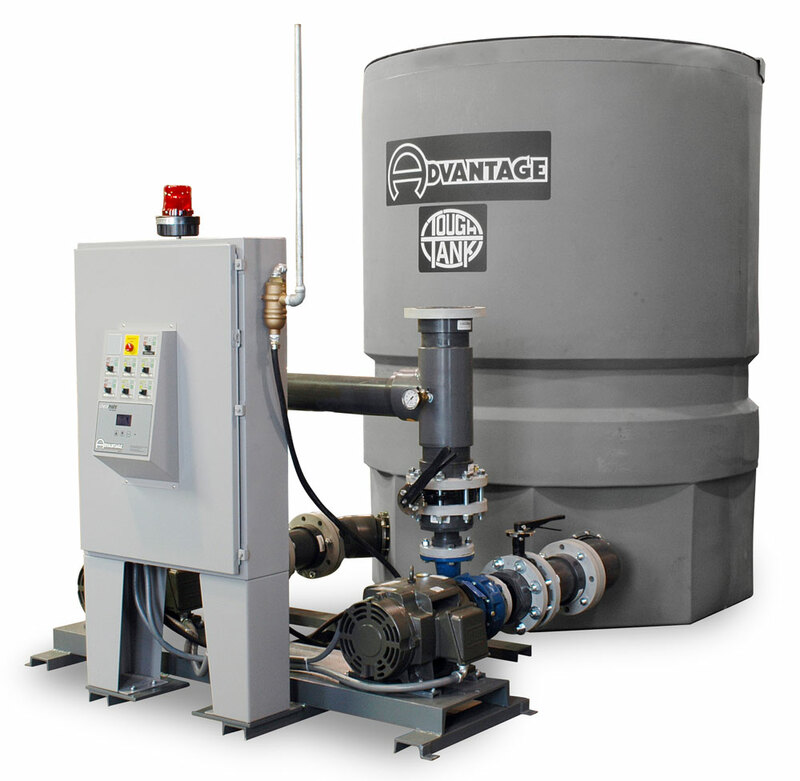 For more information about selecting the proper pump tank system call the Advantage Sales Department at 317-887-0729. Would you like to Download FYI #260 to your browser?